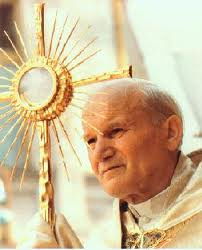 Pope Saint John Paul II has been the biggest champion of the Eucharist in recent history. This website is dedicated to him. Father Henry Dery was a member of "the Fathers of the Eucharist", a community of priests devoted to the Eucharist. He was the spiritual director of Antoine. This website is dedicated to the memory of his kind heart.